As a remodeling contractor working in the Greater Boston area, I learned early to get creative with construction waste removal. For contractors, disposal is far too often an overlooked item on bids, and can end up cutting into our bottom lines when changes in scope push the schedule of a project or we underestimate the quantity of debris. Working in an urban environment creates a unique challenge in that we don’t often have a secure location for even a small 6 yard dumpster. Here are a few ideas and tips that have worked for me in the past. Working intelligently during the demolition on a project and ongoing debris maintenance will help to simplify and organize the process of construction waste removal and reduce headaches. Make a plan of attack. Will you remove the trash through a window, stairs, or elevator? Create a staging area for all the debris that is convenient to the stairs or window. 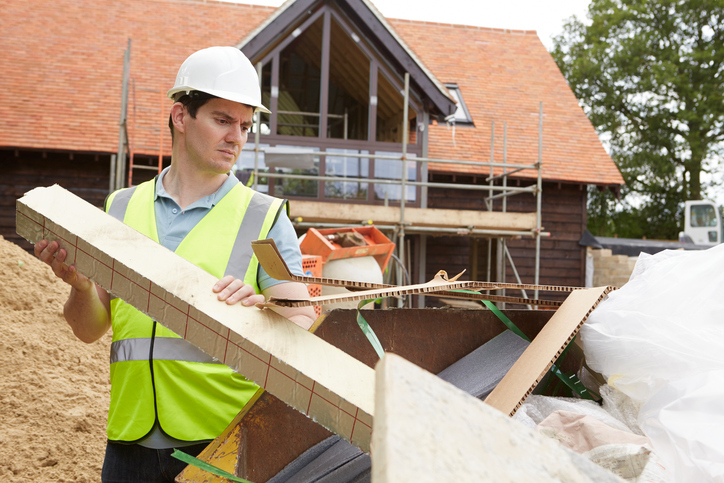 Bag all the debris with strong contractor bags and keep the weight manageable. Remember you and your crew will have to hump these down the stairs or drop them from a window. Always follow OSHA guidelines when removing waste through a window. Trash chutes can be rented or built from a few garbage cans or sonotubes and a length of rope or chain. Whether you are using a dumpster rental service or not, make sure you follow the guidelines set by the renter, hauler, or transfer station regarding LEED, concrete, appliance, or hazardous waste disposal. Keeping all the trash neatly organized and in a convenient area will streamline the removal process whether it will be done by your crew or subcontractors. Where Do I Put the Dumpster? On a lot of our jobs in the city we simply don’t have the space for a dumpster, but there are plenty of solutions out there to help you keep the job moving. We are lucky enough to own a small dump truck that we use for most of our remodeling work. It’s a basically 10 yard dumpster on wheels; we can bring it to the site when we need it and take it away when we don’t. It’s also very handy for loading tools, equipment, and materials in and out of jobs. On some of our jobs we can pull the truck right up to a window and dump the waste directly. On larger demo jobs, I will bring in extra laborers so we can quickly load the truck and get multiple loads in one day. Pickup trucks, vans and box trucks must be hand unloaded. In our city there are quite a few companies that specialize in removing trash from job sites and junk removal. They show up with a truck and 4-5 laborers who quickly load the truck and head off to dump it. They provide the labor and disposal, but you’ll pay a premium for subcontracting it. If you can’t get your hand on the labor or need to move on to start another project, this might be a great option for you. You can focus on what you do best, and leave this unpleasant task to someone else. Just write the check! You’re paying markup on someone else’s labor and cutting into your bottom line. On one recent condo renovation project, we had to remove a lot of debris quickly, and my small dump truck wasn’t cutting it. I called a local hauler with a plan. He pulled up with his roll off truck and backed the 20 yard dumpster right underneath a sliding door that overhung the parking lot. I had 5 guys on site that day, and the six of us filled the dumpster in 30 minutes, and the hauler was off to dump. The arrangement worked great for him because his total time involved was less than a typical pick up and drop off. In another instance with the same hauler, the neighbor allowed us to use his parking spot while he was at work. The hauler agreed to drop off at 9 am and pick up 3 pm. You may have to pay a slight premium for this, but our guy didn’t upcharge because we are a repeat customer. These examples might not work for every scenario, but getting to know a local hauler who might be willing to go off script to you out in a pinch is a no-brainer. If you’re looking for construction waste removal or dumpster rental in the Pittsburgh area, check out this new tool called Dumpster Market for finding the best local haulers in the marketplace. You can compare options from 10 different local hauling companies the same way you would with hotels at Hotels.com or Trivago. With a larger dumpster, you’ll remove a lot of construction waste quickly and skip the minimum tonnage fee charged by many transfer stations. Using your own labor to fill a subcontractors truck will save you money, while you still benefit from his larger capacity. You’ll have to spend some time finding the right hauler, as not everyone will be willing to get creative with you. In some situations, you may be able to rent a parking space from someone in the building you are working in or one that is adjoining. Most municipalities will also give you a dumpster permit to park on the street, for a fee of course. Having a full size dumpster at the job site is always preferable, but in some situations the above solutions may be better. A permanent job site dumpster means you won’t have to worry about working to a disposal schedule, and can do clean outs as you see fit. Your subcontractors will appreciate it, and it makes it easier for them to help keep the site clean–which is always a priority in kitchen and bathroom remodels. You’ll pay monthly rent or a recurring municipal fee. An open dumpster is an invitation to the neighborhood: “Hey throw your junk in me!” You’ll have to tarp over the dumpster and put a lock and chain on it to prevent industrious neighbors from filling it up with their unwanted furnishings and hazardous waste. Cost overruns!!! If the job runs longer than expected or there are delays, you’ll still have to pay to keep the dumpster there. As contractors it is our job to get the job done safely, quickly, and to the highest standards possible. We want to save our customers money, and also make a good profit for ourselves. Though often overlooked, waste disposal is an area where we can use new ideas and innovations to continually refine and streamline our processes, ultimately improving our workflow and bulking up our bottom lines. 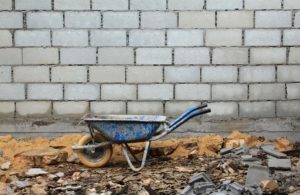 If you’re new to all of this, check out this guide to sustainable management of construction and demolition materials from the EPA. -Patrick Mulroy owns ReModern Builders LLC, a Boston-based home remodeling company. Dumpster rentals are more complex than you may think. But that doesn’t mean it needs to be difficult or a burden on your project timeline and budget. A little planning and research up front will prevent surprises that could have been avoided. Follow these best practices below and your dumpster rental experience will be a breeze. Know Your Size – Check out our sizing guide to determine how much waste you plan to need to haul and what size dumpster you need to fit it. Know Your Timeline – Understand when and how long you need the dumpster and how quickly you will fill it up. Get a Permit – Dumpsters located on city-owned property always need a permit. Other restrictions may apply. Know the Potential Fees You Face – Overtime, overfill, overweight charges can occur unpredictably and vary per hauler. Make sure you know them upfront. 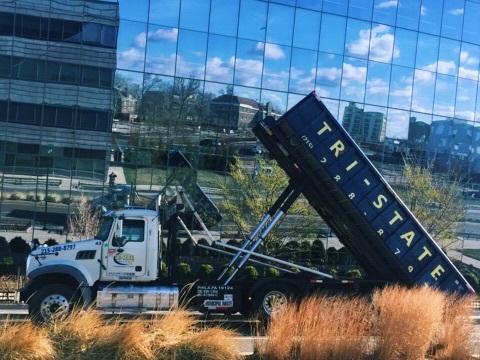 Order by category of waste – If you have heavy debris or a LEED-certified construction site, you will want haulers to treat your order differently than a standard rental. Understand limitations of the hauler – Inclines, soft ground, public walkways, trees… there are a number of variables that can impact how and where a dumpster is dropped off. Select Based on Square Footage Alone – Heavy construction debris can quickly exceed the weight capacity of a dumpster before it is even half full. Fall Back on a Swap Out – Swap outs are not guaranteed to come immediately and can cost as much as the initial dumpster rental. Assume the Dumpster Can Fit – Make sure your desired drop off point allows for truck access and room to drop off and pick-up. Overfill the dumpster – An overfilled dumpster is a hazard to the hauler as well as the public because materials can fall out of the dumpster in transit. Add waste items that don’t belong – You can’t put just any item in a dumpster. Some limits are obvious like hazardous waste, others are not, like mattresses and food. Assume haulers are inflexible – Haulers set standards so that they can control the logistics of their business. If you need a dumpster fast, or have other unique demands, always ask the hauler first! Did you know that DumpsterMarket haulers compete for your business? That’s right – search all of the available haulers in your area instantly. With guaranteed price transparency and quality service, you can be confident you are getting the best deal on a dumpster rental. Now that you know the Do’s and Don’ts of dumpster rentals, book today! What are LEED Roll-off Dumpsters? A LEED (Leadership in Energy and Environmental Design) certified roll-off dumpster is different from a standard dumpster in that it carries waste materials that can be reused or recycled rather than sent to a landfill. Reusing or recycling construction waste also saves natural resources, cuts production costs, and extends material life cycles. To acquire this certification, your construction project must be compliant with a kind of solid waste management or recycling plan. It therefore means that a LEED rated roll-off dumpster must be able to give you the required logistical support in waste disposal for your construction site to be deemed environmentally sustainable. Many contractors already employ informal recycling on their construction sites. However, if done on a large scale, the recyclable material in local markets has a positive economic impact. The only major requirement for your project is that you abide by a construction waste management plan. Roll-off dumpsters can be used to help achieve LEED certification but understanding the difference between a standard roll-off and one used towards LEED credits is essential to ensuring that your project achieves the appropriate requirements. With roll-off dumpsters for LEED credits, it is the content that matters, not the dumpster itself. As long as the dumpster is designed to fit your project needs, any roll-off model can be utilized. However, it is considered a best practice to use a separate dumpster for the materials to be recycled and applied towards your LEED credits. The permitting requirements for using a dumpster are the same as with any other dumpster. Each location has its own permitting regulations for dumpster use but specifications towards LEED credits typically are not required. While there are no specific dumpster requirements, there are limitations towards the content of the dumpster. In addition, some LEED-focused waste management companies can have standards and requirements that can also apply. Check out the U.S. Green Building Council for more information concerning requirements. Some locations require the use of a separate recycling facility while others maintain dual-use facilities. Be sure to check with your hauler to ensure that all requirements are met. Achieving LEED certification for any project, both large and small is a great way to show your commitment towards a sustainable future for all. By using a dedicated roll-off dumpster, you can not only make your project a success but help your community as well. Check for available dumpsters in your area. Getting a dumpster rental permit in Pittsburgh is easy if you plan ahead. The city requires you to first obtain a permit before renting the dumpster. These metal containers make any remodeling or construction job easier though and well worth it! When do you need a dumpster rental permit in Pittsburgh? If your neighborhood is governed by Homeowners Association rules, you might want to get permission before placing a dumpster on the street. You can apply for your permit in Pittsburgh at the Department of Public Works. After filling out the application and paying the associated fee at the permit counter, approval will be granted. These fees are for the permits and are not connected to the rental costs of the dumpster. Commercial jobs are usually more time consuming than residential work, but if you have plans for long-term residential work or short-term commercial work, the permit office may be able to work with you. Also, the city has expanded the number of payment options available for those seeking a roll-off dumpster permit so that applying for one in person will be more convenient. Once you sign a contract with a dumpster rental agency, the unit will be delivered and placed by the rental company, then picked up at the time and date on your rental agreement. Make sure to you check out which items and materials are not allowed inside a dumpster. What can be thrown away in a roll-off dumpster? Whether you are doing a bit of remodeling or moving and getting rid of unwanted items, a roll-off dumpster can help you dispose of most of your waste easily and efficiently. Simply apply for a permit at your Department of Public Works permit counter and schedule a dumpster rental delivery with your local hauler. Additionally, with a variety of sizes to choose from, you could fit almost anything in a dumpster. However, there are some materials that are absolutely prohibited. You can always call our customer service reps at 844-728-3533 to discuss your project – they’ll quickly help you decide if what you are throwing away will be allowed in a dumpster. The first easy way to determine if an item can go into a roll-off dumpster is to check it for warning labels. If the label contains a poison, chemical or biohazard symbol, it needs to be disposed of according to the instructions on the label. If there are no disposal instructions, you can call your local sanitation department to find out how to properly dispose of these dangerous materials. Now, onto the less obvious items..
What types of waste can be thrown into a roll-off dumpster? Common household items including clothes, various personal items, and housewares can be thrown into a dumpster. If you are renting a dumpster because of a remodel, most of the debris including lumber, drywall, flooring, siding, and cabinetry can be placed in it. Appliances. Unless otherwise stated appliances like microwaves and washers are typically accepted. Refrigerators are not. Furniture. Wooden furniture is always accepted. Couches, bed frames, chairs, stools, tables etc…are very common items thrown into dumpsters. Check local restrictions on upholstered pieces to be safe. Yard Debris. Yard debris is usually accepted. In some locations, you may be able to dispose of tree limbs, bush trimmings, and shrubs in a dumpster. Other locations may only allow a few bags of leaves. Stumps are often not accepted. Asphalt, Shingles, Brick, or Concrete. May be disposed of in dumpsters. In some areas we have discounted price offerings specific to heavy materials. Attention to weight limits is key when disposing of heavy debris. What types of waste cannot be thrown in a roll-off dumpster? Do you have questions about what you can put in a dumpster? Contact us today for more information on available dumpsters in your area.